The AC joint is at the top of the shoulder where part of the shoulder blade (the acromion of the scapula) and the collarbone (clavicle) meet. Like the knee, ankle and elbow, there are a number of ligaments that hold the joint together. An AC joint sprain, or shoulder separation, occurs when one or more of these ligaments are stretched or torn, which most often happens when a player is driven into the turf shoulder first. As with any sprain, there are grades of severity of AC joint injuries. Grade 1 injuries are relatively minor, and involve mild stretching and microtears of the ligament fibers. Grade 1 injuries are usually treated with ice, sling immobilization and anti-inflammatories and players are at low risk of missing snaps the following week. Grade 2 and 3 injuries are more severe, with increasing amounts of damage to the ligaments stabilizing the joint. In a Grade 3 injury, all ligaments are completely torn and the collarbone is no longer tethered to the shoulder blade. Most Grade 2 injuries are treated with ice, rest/rehab and sling immobilization, with return to play within 1-4 weeks (depending on the severity of the sprain). Grade 3 injuries can be treated without an operation, but many NFL players choose surgical treatment — as Sam Bradford did before the draft — to limit the risk of chronic pain and range of motion problems. Recovery time following AC joint surgery is often 4-6 months. Though sometimes confused with shoulder separations, partial (subluxation) and complete dislocations of the shoulder occur at a different part of the joint. The most common type of shoulder dislocation occurs when the arm is extended away from the body and pulled backward, with the upper arm bone (humerus) pulled forward and out of the shoulder socket. During the dislocation, the cartilage, ligaments, and muscles around the shoulder joint can be damaged, leading to varying degrees of instability in the joint. The presence and degree of these labral cartilage tears, fractures to the upper arm bone, and ligament tears determine the likelihood of future dislocations and whether surgery may be recommended. Players may choose to play through minor injuries with the aid of pain relievers and a harness. If surgery is necessary, recovery and rehabilitation usually take 4-6 months. 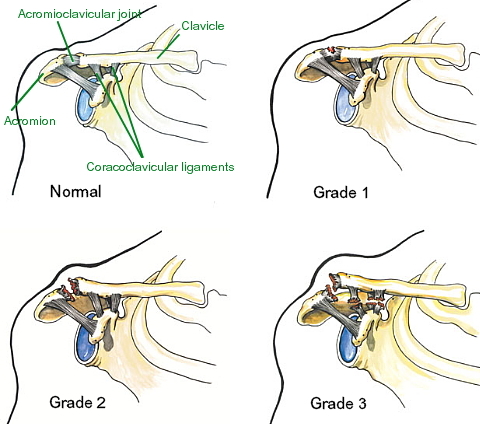 The clavicle, or collarbone, connects the sternum (breastbone) to the shoulder and can be broken after a fall onto the shoulder directly or on an outstretched arm. Many fractures, particularly in non-athletes, are allowed to heal without surgery. Recently, however, orthopedic surgeons are choosing to treat these fractures surgically to ensure better anatomic healing and to shorten the time an athlete can be cleared to return to contact. Surgical repair of clavicle fractures once meant 6-12 weeks of rehabilitation, but players are now returning to play very quickly. While it shouldn’t be considered the norm, Marques Colston returned to the field after clavicle surgery in less than three weeks in 2011. ‹ Peyton Manning Looks Fully Recovered…But Is He?